But lately, Miles's spidey-sense has been on the fritz. When a misunderstanding leads to his suspension from school, Miles begins to question his abilities. After all, his dad and uncle were Brooklyn jack-boys with criminal records. 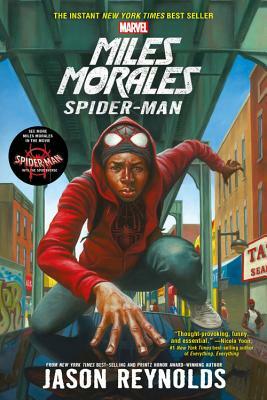 Maybe kids like Miles aren't meant to be superheroes. Maybe Miles should take his dad's advice and focus on saving himself. As Miles tries to get his school life back on track, he can't shake the vivid nightmares that continue to haunt him. Nor can he avoid the relentless buzz of his spidey-sense every day in history class, amidst his teacher's lectures on the historical benefits of slavery and the modern-day prison system. But after his scholarship is threatened, Miles uncovers a chilling plot, one that puts his friends, his neighborhood, and himself at risk. It's time for Miles to suit up. JASON REYNOLDS is the author of the critically acclaimed When I Was the Greatest, for which he was the recipient of the Coretta Scott King / John Steptoe Award for New Talent; the Coretta Scott King Honor books The Boy in the Black Suit and All American Boys (cowritten with Brendan Kiely); As Brave As You, his middle grade debut; and National Book Award finalist Ghost, the first in a four-book series about kids on an elite track team. Jason recently moved to Washington, DC, but before that spent many years in Miles Morales's very own Brooklyn, New York.